Missing: Shayna Kleffman, age 4, was last seen attending a Philadelphia Phillies game on Aug. 22, 1991. She has blond hair, blue eyes and was wearing a pink T-shirt and white skirt at the time of her disappearance. Witnesses say they saw Shayna approaching a man on top of the Phillies' dugout shortly before she was reported missing. The suspect is described as a furry, green manbeast with a large horn in place of a nose or mouth. 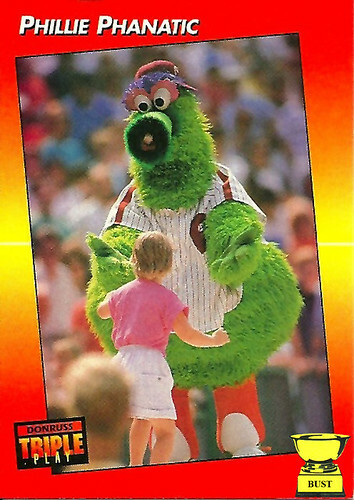 He was last seen wearing a size 7XL replica Phillies jersey, a red ballcap turned sideways and orange baseball stirrups the size of duffel bags. The suspect has big, beady eyes and may be mentally deranged, police say. He is described as large, violent and extremely stinky. If you have any information on this case, call our tip line at 888-BBC-BUST.